Desolation DS-2 ST, LP-Shaped Guitar from Charvel in the Desolation series. Charvel introduces its new Desolation series guitars. There are 10 new guitars in the “first wave” of the Charvel Desolation series—four single-cutaway “DS” models, three double-cutaway “DC” models and three Skatecaster “SK” models based on the Charvel Surfcaster of the early 1990s. All feature mahogany bodies and necks, dual humbucking pickup configurations with three-way toggle switching, solid and transparent finishes (with flame maple veneer on trans finishes) and black nickel hardware. 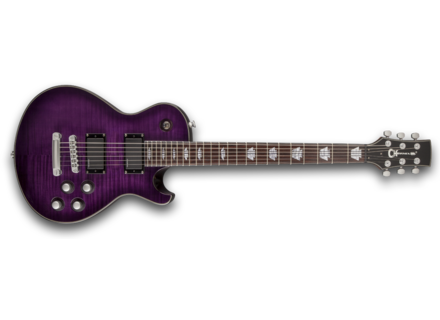 Most feature compound-radius (12”-16”) rosewood fingerboards with 24 jumbo frets in a variety of neck-through, set-neck and bolt-on configurations; Charvel bridges specially designed for compound-radius fingerboards (except DS-3 ST Floyd Rose-equipped models); and three-on-a-side locking Charvel tuners (except DS-3 ST and Floyd Rose-equipped models, which have non-locking three-on-a-side tuners). Find out more on this news series from www.charvel.com. Gretsch G6120 Eddie Cochran Signature Gretsch introduces the G6120 Eddie Cochran Signature Hollow Body guitar model, a single-cutaway with western motif which combines features based on Cochran’s orange Gretsch 6120 Chet Atkins hollow body guitar. Carvin VT16 Micro Head Carvin announces the latest addition to its Vintage Series amplifiers. Delaney Guitars The Wedge Delaney Guitars unveiled its newest guitar, the “Wedge” while exhibiting at Summer NAMM in Nashville, Tennessee.